This is a somewhat abbreviated WebLetter. We have had less feedback than usual and much time was taken installing the new Boatbuilder Connection. We have had a variety of reactions to the new board, mostly favorable, but there have also been negative reactions... "Why in the name of heaven did you change the boat builder connection? IT WAS FINE THE WAY IT WAS!!!!!!!!!" I was also skeptical about the new format. I do not have a lot of experience with other boards and really liked the old format. However, as I have become used to the new board, I can see a lot of advantages. It should be easier to find information about specific topics. As new messages are added, the string moves to the top of the list, making it easier to find the latest additions. I would suggest that if you start a new string, that you give it a title that will make it easier for others to find. There have been comments about the fact that passwords are not "required". I wanted to keep the board as user friendly as possible, so do not intend to make the password mandatory unless the board is abused. I would suggest that if you intend to visit on a regular basis that you do register. This allows the program to display a list of posts since your visit and a few other features that are only operational if the program knows who you are. If anyone has suggestions for new topic headings, I would be happy to add them. Thanks for the feedback about the WebLetter. A few of the suggestions have been added to this WebLetter and more will be incorporated into future issues. The WebLetter is meant to be of help and to give encouragement to our builders, so your input is critical. If the weather has slowed your project, this might be a good time to write an article to share your experiences with your fellow builders. Another purpose of the WebLetter is, of course, to familiarize you with our products and to encourage you to buy them... it's what keeps us in business. As always we would like to thank all those who contributed to the WebLetter, especially Mark Bronkalla who is a regular contributor and who graciously shares his knowledge here and on the Boatbuilder Connection. Several other builders have indicated that they intend to write articles. They may feel that since so much time has passed since the offer to write, that we are no longer interested... not so. We always welcome your input. I do not know if we will post another letter before Christmas and New Year, so all of us at Glen-L would like to take this opportunity to wish you happy holidays. Slow down and enjoy your family, be patient, and share the joy of the season. The Audeen was named in honor of Audry Green... a friend of Glen's at the time the boat was designed. The original test model was built by Warren Trombly behind a shop where he had a business building water skis. Warren also built the Sea Knight that was featured in five issues of Popular Mechanics magazine. At the time it was designed, we called her "modern". Today we call her a "classic". The Audeen and Mist Miss were designed in 1955. Both designs were meant to evoke the feeling of the classic mahogany runabouts of earlier years, but incorporated a bottom shape that allowed them to take advantage of the larger automotive engines that were becoming available. The most common power source today is a small block Chevy. The Mist Miss is a larger version of the Audeen and cannot be extended. Inherent UV absorption due to the molecular structure of the linear (aliphatic) polyurethanes. Recoating windows of up to 3 days without sanding (see manufacturers directions for details). Extreme toxicity. Forced air respirator, skin and eye protection are a MUST. There are NO approved cartridge respirators - the isocyanates are odorless. 10-25% chance of developing chemical induced asthma which is permanent from exposure to the isocyanate hardeners. Relatively high "buy-in cost". Need appropriate thinners, reducers, hardeners, forced air respirator and HVLP spray gun. Not for the casual user. These are designated as "professional use only" products. In some areas it may be hard to purchase as an amateur. Local dealer started to get worried with my questions. They are very concerned with safety and potential liability. Freely available, published info is sketchy. It took a bit of digging to find the links listed. The Dupont information is in a sign-in only area of their web site. An excellent alternative to doing your own spraying, is to prep the boat and have a body shop spray on the finish. Many feel that building a boat by the cold-molded method is new and revolutionary. The cold-molding process as used in this dissertation is using thin multiple laminations of relatively narrow (about 6") wood or plywood, bent over a form and progressively glued together. The laminations generally cross one another at oblique angles with a minimum of two or more layers. The process lends itself especially to round bilge boats so the laminations can extend from keel to sheer without a seam. However, the use of cold-molding on vee bottom boats with a reinforcing chine is also widely used. The cold-molded method is essentially making plywood over a form with the advantage that some compound curves can be introduced. It also provides a smooth, leak proof, monocoque structure that is incredibly strong for its weight. The possibility of leaking between seams is virtually eliminated as each junction is backed with another laminate. When and who first started building cold-molded boats is unknown. During WW II the method was used on PT boats, and many were built. During this same era the British built the cold-mold process de Havilland "Mosquito" twin engine bomber. And the famous "Spruce Goose" was built by Hughes Aircraft under the leadership of Howard Hughes by the cold-mold method. True, the amphibious airplane only flew once for a short distance, but the structure remains solid. About the mid-forties, many cold molded hulls were commercially produced. The process was somewhat involved and tooling costs were high. This was not for the "mom and pop" boatyard. The typical cold-molded hull was usually under 20' to cover the more popular range. Typically five to seven laminations of 1/16" mahogany or spruce veneers in 3" to 6" widths were used. These strips were coated with phenolic resin type glue and allowed to dry. The strips were applied over a mandrel the shape of the boat and stapled in place. The structure was then placed in an airtight bag and a vacuum applied to force the laminations together; then rolled into a large oven or autoclave and baked under high steam and heat to cure the adhesive. The hull was then removed and the exterior staples removed and a filler forced into seams to cover minor imperfections. The formed hull was then placed in a fixture to keep it in alignment while the transom and other members were installed. Interior reinforcement was minimal and the interior clear of any obstructions; quite unusual for the time. Due to the tooling cost, U S Molded Shapes, Inc. and a few others produced stock hulls to 20' and sold them to other companies to finish out and market. Early in the fifties these boats were available, on a limited scale, to the home builder to finish. Mass production of this type of construction virtually ended with the advent of fiberglass boats. However, the durability of these hulls was never questioned and many are still in use today. Cold-mold construction of a somewhat different type was used to build the popular mahogany runabouts such as Chris Craft, Century, Hacker, and others. These boats, when planked with solid planks with batten seam construction, leaked until they were in the water long enough to swell the seams. Transporting the boat to varying locations was a chore as the boats dried out while on the trailer and might take a day or so after launching to become watertight. The glues of the day were not actual adhesives; they were more of a caulking mastic and could be pulled apart with little effort. In an effort to solve the problem and possibly to make the final longitudinal planking thinner and easier to bend, the bottoms were diagonal planked followed with the typical longitudinal planks. The boats still leaked. Some tried canvas between the lamination, but after a time the canvas deteriorated and the old problem still existed. 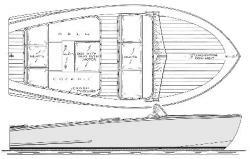 Today most of the runabout mahogany boats built use a diagonal underlayment, but with at least two laminations, typically plywood, followed by thinner longitudinal solid wood planks. Plywood has been used for the final planks of these runabouts, but the outer veneer is very thin and the general appearance is not as appealing. These hulls don't leak due primarily to the epoxy adhesive, usually with thickeners used between the laminations. 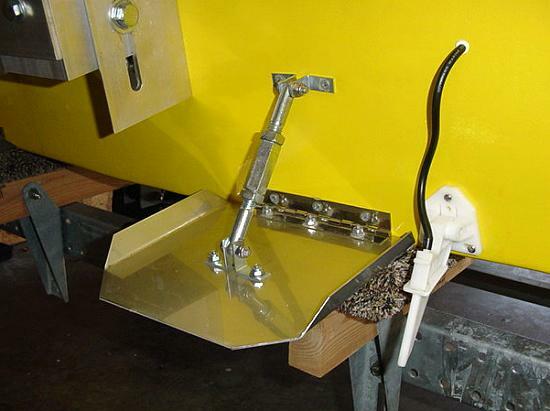 Encapsulation of each piece and final epoxy coating has eliminated most of the older problems. 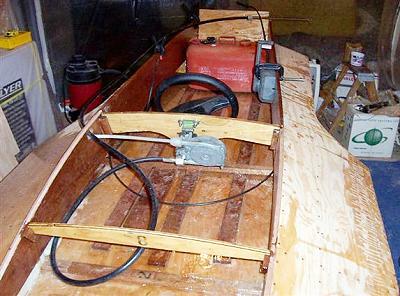 Building cold-molded round bilge boats as were manufactured yesteryear has been modified; expensive mandrels, air bags and autoclaves are eliminated and building a single boat is practical. The diagonal laminations are bent over a hull framework to provide the hull shape and progressively stapled in place with thickened epoxy between each lamination. Epoxy with thickeners fills minor voids and still maintains structural integrity. It's a simple way to build and is thought by most to be easier to do but requires more time. The vacuum airbag is often used to assure a positive bond between the laminations. As is often the case, the old timers had the right idea. The problem was that the adhesives of the day were complex and costly to use. Epoxy adhesives and modern methods have popularized cold-molding, which is now thought of as a new procedure by many builders. If you are considering building a boat, consider the cold-molding method. It's not the total answer for many boats, but well worth considering for many. * If you can think of a reason, please send it and I will post your answer in the next WebLetter. Nineteen hundred and sixty was a good year to begin building a family ski boat for the families of Dean DuVal and Dwight Davis of Riverside California. 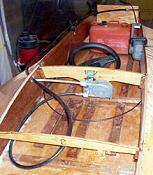 Both men wanted quality and durability built into the boat for the "many ski trips to come". Little did they know, that their attention to craftsmanship and detail would lead to a boat that is still performing well over forty years later! 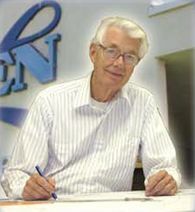 Construction began with the purchase of Glen-L Audeen plans and Frame Kit. State of the art fiberglass over wood was the construction of choice. Mahogany plywood was used for the top deck and transom for its inherent beauty. Providing the power, a Graymarine Fireball V-8, 327 cu. in., 238 HP, direct drive engine with a Warner Velvet Drive transmission. Many years later, Bennett hydraulic trim tabs would be added for stability and control. The project took eighteen months to complete and included fabricating a custom trailer and even an addition to Dean's garage, complete with overhead rail hoist. Completion in 1962 was celebrated by a launching on Good Friday at Puddingstone Reservoir in San Dimas California (near Los Angeles). Regular trips to the waters of Southern California proved her to be a reliable and strong hull and the drive system worked even better than expected. Family trips soon became ski trips for the guys. Four or five in a Buick Wildcat with boat in tow was a way of life for many years. Lake Havasu on the Colorado River was a favorite spot for weekend getaways. Other trips have taken the boat to lakes and rivers in Nevada, Arizona, Utah and, of course, to the Pacific Ocean. It was on one of those Havasu trips in 1965 that I began my association with the Glen-L Audeen. My brother, Lee, worked with Dwight and became an inseparable ski buddy on every trip. Lee invited me and paid my way on one of the ski weekends and I soon became a regular. By 1970, Dean had shown an interest in selling his part of the boat, so Dwight, Lee and myself became co-owners. The next pivotal year was 1974 when a large section of fiberglass peeled from the bottom of the hull. I took on the task of repair and inverted the boat in my garage for the re-glassing. Working on the boat revealed to me the inherent strength and durability in the design and construction. Not only was assembly technique strong, but also the constant curves throughout add tremendous strength against the ever-changing forces of the water in storm conditions that are no stranger to our Audeen. The work was progressing for re-launch in 1975 but was stopped with the tragic loss of my brother Don, in an industrial accident. Nineteen seventy-five became the only year in its long history the Audeen did not enter the water. Work began again and the boat became wholly mine when Dwight moved on to other areas with his family and Lee bought another boat. The boat was back in the water the summer of 1976, our 200th anniversary as a nation. I was now a married man with two small boys. These two little guys took their first rides in the boat before they were one year old. Officially now, the "family" boat was just that, the men's trips had ended. Countless families and friends, youth groups and college kids have gone boating and camping for the past 25 years with this Glen-L boat that began as a vision in 1960. These people have used every towable from skis to wake boards, tubes to torpedoes in crossing the waters behind the "Legend of the Lake". The years of service, however, took their toll. The winter of 1989 was a time of renewal for paint and upholstery. In 1996 a complete engine rebuild, with updated electronic ignition was added, the final step for putting new life back into the "Legend". It's in condition now to carry it well into the 21st century. The Audeen shape, the natural mahogany, and the excellent condition of a forty plus year old boat brings many people to stop, look, and listen as the engine roars to life. Of course, the boat is also an attraction on the trailer, I have told the story of its history in parking lots, rest areas, gas stations, etc. And the story continues, my two sons have become masters at towing and operating "the boat", my grand children are just beginning to sit on my lap and steer the boat just as their fathers had done, nearly thirty years ago. It's truly a family boat that has bonded us and still brings us together for some of our best times. I have heard from a few folks that built the TNT that like me had a porpoising problem. Well, I set my cockpit a little farther back and had the same problem so I fixed it by building a set of adjustable trim tabs. I bought a 12" x 24" piece of stainless steel sheet (from MSC Corp. @ about $18.00) and sheared it into shape. Then I bought a piano hinge ($5.00) and a couple 1/2" bolts and coupling nuts ($3.00) and assembled them as shown. They work great. Here is a picture. > only carry 1050lbs. This doesn't seem right since the pontoons are the > same depth and width. Although these figures are approximations, dependent on the weight of materials, they are essentially correct. The ends of the 16' and larger are tapered and have less buoyancy. They rise both fore and aft, so that when displacement is given at the same waterline on all, the swim platform has more buoyancy for its size. The longer platform on the 16' also adds weight/reduces capacity. 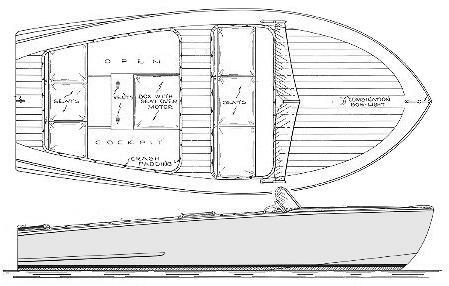 Capacity can be increased by using lighter materials in the hulls. Don't remember if this was sent to you before this but attached is a cute article someone at Carolyn's residence put together recently. That's Carolyn in the center and don't know who the other ol' goats are... probably members of the "yacht club". Three months ago I decided to build a sailboat. This is a new idea and challenge for me. I doubt you recall, but I asked your advice on the type of boat that might be good for a novice builder and sailor. I gave you 3 choices the Glen-L 17, the Glen-L 19 both of which I have complete plans for and the Glen-L 13. In a very nice way you suggested the 13 and I must say that after some musing, I can see your wisdom. Rest assured that when I decide to embark on this project I shall be ordering a set of plans. Sound advice is hard to come by and should be considered when it is given. Thank you very much. Now for the topic in the subject line. Whenever I get involved in something new I try to assemble a reference library on the topic. Over the past months I have been looking at and purchasing various textbooks on boat building and sailmaking. I have acquired four separate texts on boat building and have read selected chapters in each. I am well versed in reading technical material (medical) and have found the subject of lofting, although most critical in the building of a boat, rather difficult to understand as it is presented in 3 of the 4 books I now have. The book that has gotten it across to me was copyrighted in 1962. The addition I have is the fifth printing copyrighted in 1974 "Boat Building with Plywood" by Glen L. Witt. I would guess this is either your father or grandfather. At any rate, it is a first class work that has made a very complex topic understandable and easy to apply and put into use in the real world. It is well illustrated, has good photographs, and a writing style that flows easily and covers the subject in a straight forward non-mystical approach. I would recommend this text to anyone who is considering building a boat. One cannot build what one does not understand. Your families' contribution to shipwrighting is monumental in the simplicity and quality of this work. Note: Glen-L plans do not require lofting, but the subject is covered in "Boatbuilding with Plywood". Comments: I am currently enrolled in the Marine Tech program at Skagit Valley College in Oak Harbor, WA. A fellow student told me of your web-site and it has proved to be very helpful in supplementing class materials. Lots of information I can access on the weekend when an instructor is not available! Thanks! Comments: I built a 16 FT dory several years ago from your plans. The plans were quite good and I had fun building the boat. It was a fun project and a good change of pace from my hectic daily schedule, a good way to relax. PS I'm looking at plans for my first cruiser.